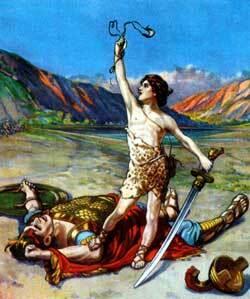 David slays the giant Goliath. HE ISRAELITES AND the Philistines were now at war together, and the two armies were posted on two mountains, with a valley between them. And while they were drawn up in sight of each other, a giant, named Goliath of Gath, came out of the camp of the Philistines, and challenged any one of the Israelites to come and fight with him. If he killed the Israelite, then the Israelites were to yield to the Philistines; but if the Israelite killed him, then the Philistines would serve them. He was a huge giant, nine or ten feet high, clad from head to foot in heavy brazen armor. The staff of his spear was as thick as a weaver's beam. And for forty days this terrible giant came out, defying all the Israelites. Even Saul himself, the king, who was a brave man, was afraid of him. Now at this time the three eldest sons of Jesse were in Saul's army; and their father bade David, who was tending his sheep at Bethlehem, go to the camp with some parched corn, and bread for his brothers. He arrived there just as the two armies were advancing to battle; and as he talked to his brothers, out came the giant, defying the Israelites, who fled at the very sight of him. David was indignant at seeing the armies of God's chosen people so contemptuously treated by a heathen, and he asked those about him what should be done for the man who killed him. They told him that he should have honors and riches, and that he should marry the king's daughter. Then Saul, hearing what David had said, sent for him; and David told the king that he would go and fight the giant. Saul reminded him that he was but a youth, and the Philistine had been a soldier all his life. But David answered that he had killed a lion and a bear that had attacked his flock, and he knew that God would also help him to kill this great giant. Then Saul would have given him armor and a sword, but David would not have them. He took only his staff and sling, with five smooth stones in his shepherd's bag, and went to meet the giant, who came on cursing and taunting him. But David, running forward, took a stone from his bag, and slang it at the giant, whom it struck in the forehead, so that he fell on his face to the ground, and David cut off his head with his own sword. Then the Philistines took to flight when they saw that the giant was dead.